Make This Your Year to Boost Your Credit! A good credit score is an absolute requirement for becoming a homeowner. 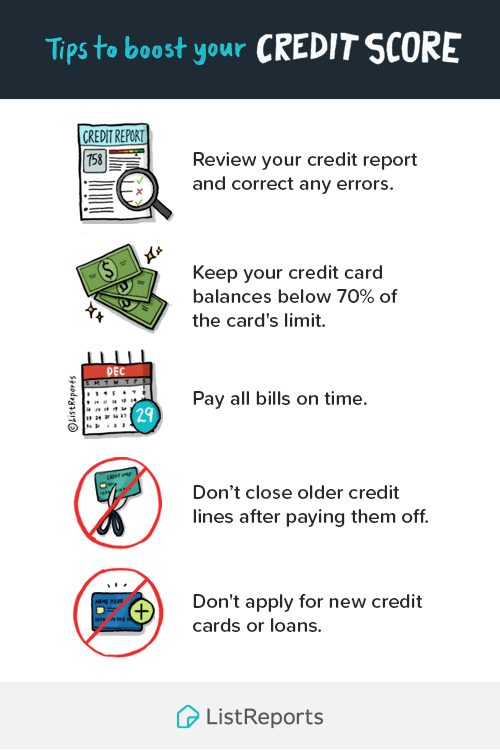 Whether you have no credit or a lower credit score, these steps will have you seeing improvement in your scores! Before you start trying to improve your score, it is important to make sure your credit history and the various accounts showing on it are accurate. Downloading an app like Credit Karma will allow you to review what is currently impacting your credit score, and to monitor it on a regular basis going forward. It is always good to tackle credit card debt first. Paying off student loans and mortgages help raise your score, but reducing credit card debt will have the biggest positive impact. Prioritize paying down the cards that have the highest interest and are closest to their limits. Getting your balances below 10 to 30% should greatly improve your score. Late payments have the biggest negative impact on your credit score, so keeping your finances current is the best way to get closer to that magic 850 score. Use personal finance tools to see where your money is going an to alert you when your bills are due. Consider setting up automatic bill paying through your checking account to ensure your payments are on time. Cutting up your credit card and closing the account may seem like a great way to celebrate after making your last payment, but doing so won’t help your score! Believe it or not, canceling credit cards will lower your credit score. Even if you don’t use a credit card, keeping older accounts open and paid in full shows lenders you have a long track record of good credit behavior. In addition, closed accounts will still show up on your credit report and can be factored into your score. It’s especially important to keep this in mind if you’re applying for a mortgage. Financing a car or opening a new line of credit can throw off your debt/income ratio – which is vitally important to lenders when considering your mortgage pre-approval. Try not to charge anything or apply for any other loans during this period. If you’re under contract on a home, this could actual disqualify you from your mortgage, which means you don’t get your new home AND could face losing your deposit. Building up a good score from a low point will take time and discipline – don’t expect an immediate improvement! But if you commit to your goal and keep working at it, your future self will thank you!